Glam Morena: Swatches: Milani Powder Eyeshadows. 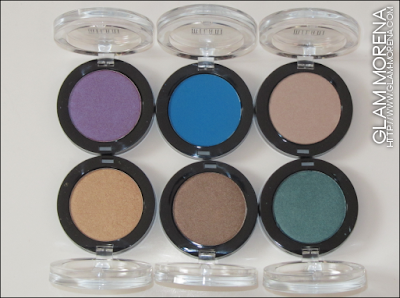 Milani has come out with so many new products for 2012 and now I'm going to be sharing with you the new Milani Powder Eyeshadows. Milani used to have single eyeshadows, but they were discontinued. Some of these shades are similar to older shades and some are a bit new. The eyeshadows are exclusively available at select CVS stores only. Description: Super pigmented, easily blendable, crease-proof, silk-like powder eyeshadow. 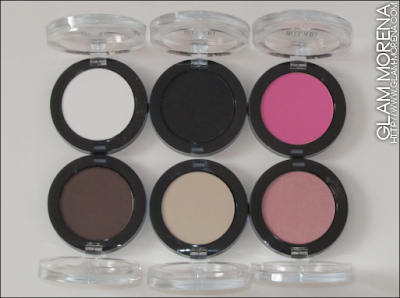 Playful colors in both matte & pearl finish that can be used as shadow or liner. Available in 12 shades. Be sure to watch the video for an individual close up of each shade! 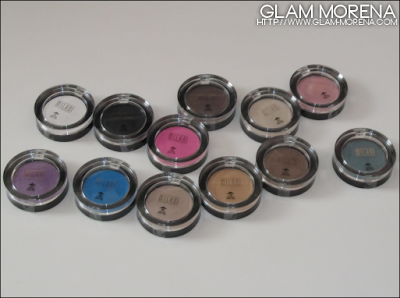 Now on to swatches of the Milani Powder Eyeshadows! The eyeshadows are swatched in the same order as up above. Have you tried the new Milani Powder Eyeshadows? Favorites? Thoughts? the Olympian Blue is such a lovely shade!